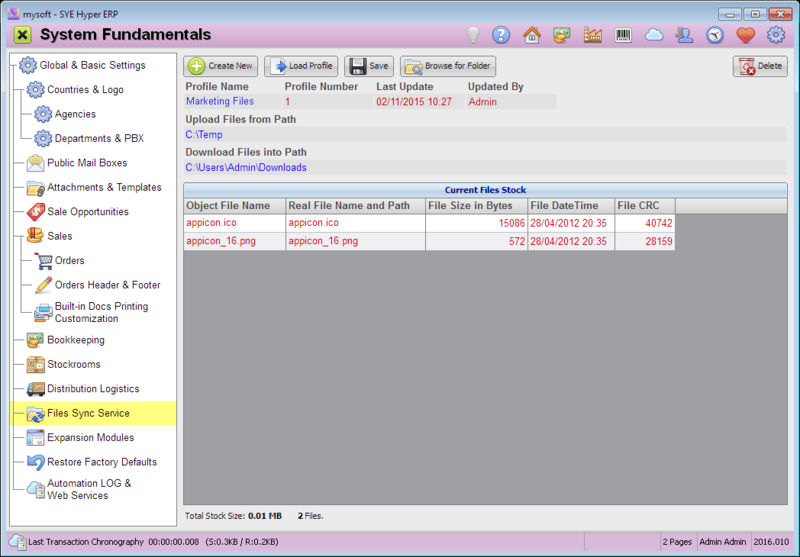 This is the files sharing tool of Hyper, that allows to share and sync files between the organization computers, by using Hyper Files Synchronization Application. Fill in the profile name. Select the path for the uploaded files in the "Upload Files from Path" field. Select the path for the downloaded files in the "Download Files into Path" field. Press the Save button, at the top of this tab. Open the SYE Products Installer, select the SYE Hyper Enterprise tab and choose the "Show Applications list for the END USER" option. Press the Continue button. From the list of applications, select the "Files Synchronization" and press the Continue button. Read and Accept the terms and select the required path for the installation and press the DOWNLOAD & INSTALL button. The Files Synchronization tool will be added in a new folder on the selected path. Download files to the local folder. This action will synchronize the local files folder with the shared folder. Please note - This action removes the current files from this folder and adds the files from the shared folder, so that every modification in this folder will be executed in the local folder as well. upload files to the shared folder. This action will synchronize the shared folder with the local folder. Please note - This action removes the current files from this folder and adds the files from the local folder, so that every modification in this folder will be executed in the shared folder as well.